Chinta (acted by Siput Sarawak) is a girl brought up in an idyllic coastal village, and unaware of her true identity as the daughter of the neighbouring Indrapura royal family who were ousted during a coup. This film follows her as her love for Sanchi (S. Roomai Noor), a stranger washed ashore from a shipwreck who is actually the current king of Indrapuri, is pitted against her obligation to revenge her family. In the film narrative, “Indrapuri” is the name of a fictional North Brunei kingdom in existence more than 500 years ago. In reality, “Indrapuri” is the name of an ancient Hindu Kingdom based in Northern Sumatra, where Aceh Besar Regency, Indonesia, is situated today. However, the film crew did not have to travel far to Brunei or Aceh for coastal village locations that might resemble what it was like in the annexed territories of the Indrapuri kingdom. They found them on the island of Singapore — a late-1940s Singapore still recovering from the aftermath of the Japanese Occupation; with an island landscape yet to witness overt urbanisation and still with much natural coastlines to boast of. 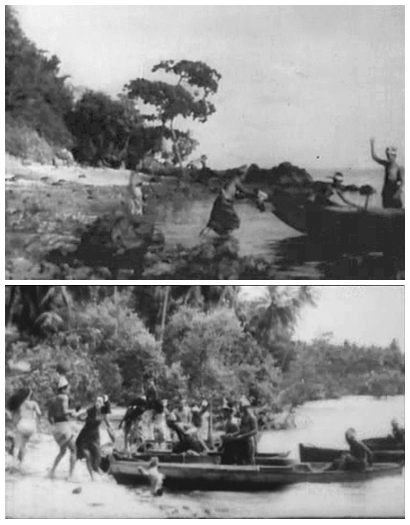 According to a Straits Times article (31 October 1948), “most of the outside shots were taken close to Ponggol Beach on Singapore Island”. 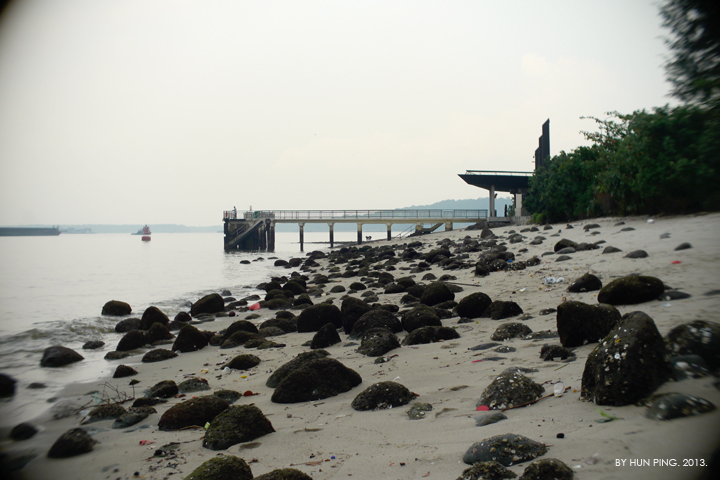 The rocky beaches and intertidal mangrove shores that used to surround Tanjung Punggol (Punggol Point) masqueraded as the idyllic coastal village where Chinta, the young daughter of the deposed king, is placed in refuge. It was probably the same coastal beaches where the brutal Japanese army shot dead hundreds of Chinese residents during a Sook Ching operation in February 1942, a mere six years before the production of the film. Didn’t seem as idyllic as it was meant to be, eh? 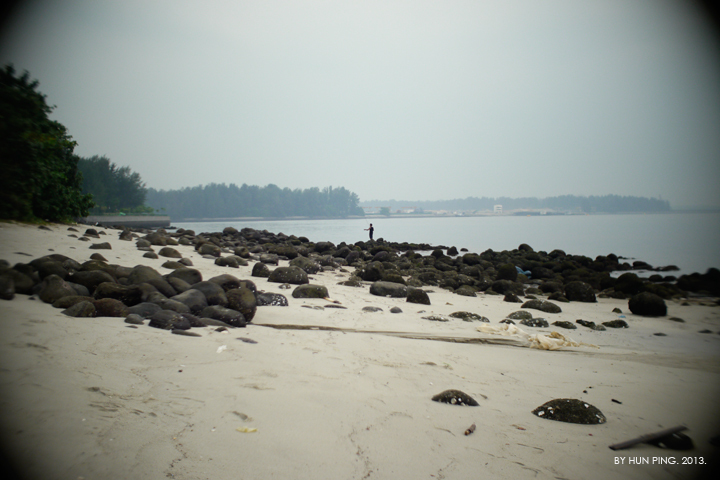 Tanjung Punggol = A Fishing Village from 500 years ago. Collage of film-stills from “Chinta”. 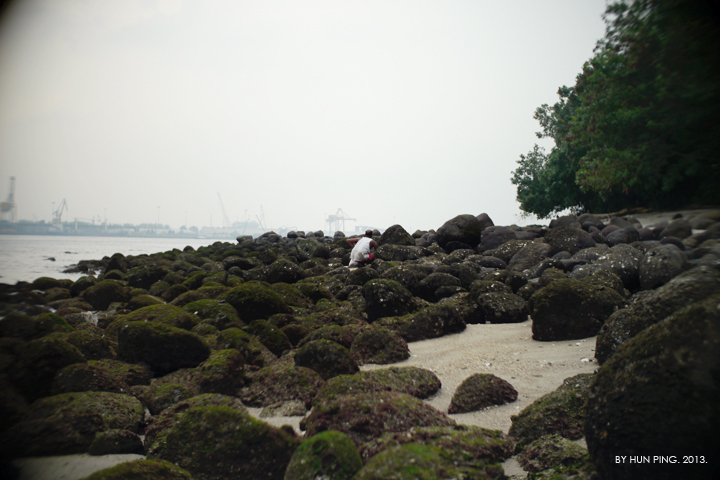 Rocky beaches and sandy shores, presumably around Tanjung Punggol. Collage and film-stills from “Chinta”. Chinta and her entourage awaits Sanchi’s arrival on a perahu, among the sandy beach, coastal shrub vegetation and coconut palms of Tanjung Punggol. On the opposite shore lies Pasir Gudang across the Johor Straits. They frolic among coastal rocks and mangrove roots. Film-stills from “Chinta”. 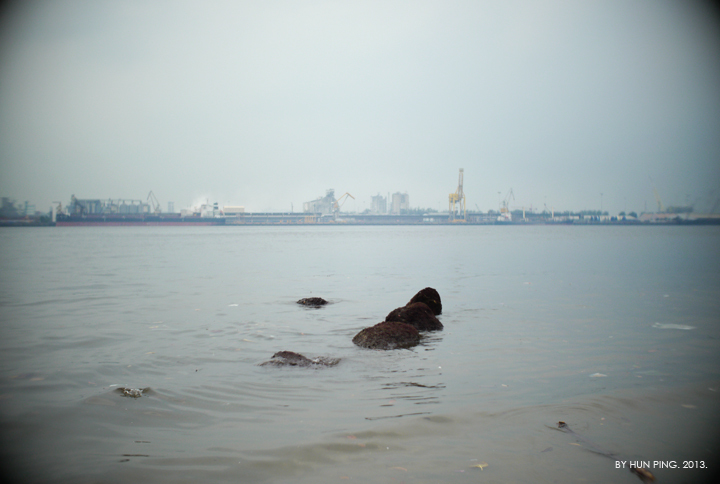 The rocky shores of Tanjung Punggol, where Chinta and Sanchi took leisurely dips and frolicked to the tunes of romantic serenades. Collages and film-stills from “Chinta”. The mangrove shores of Tanjung Punggol, high tide. The stilt roots of the mangrove Bakau tree are seen in a different light when a pretty film couple in their swimming gears rollicked and reveled among them. The pleasing song that Siput Sarawak and S. Roomai Noor lip-synced to during their frolic among the half-submerged rocks and web of stilt roots is “Kumbang dan Rama-Rama” (literal translation: Bumblebees and Butterflies? ), composed by Zubir Said (who also composed Singapore’s National Anthem) and sung by P.Ramlee and Nona Asiah. Tumu (the Bruguiera gymnorhiza) trees? Bakau (Rhizophora) trees? The mangrove shores of Singapore’s Tanjung Punggol masquerading as a coastal village in Indrapuri. Film-stills from “Chinta”. A kampung house on stilts in a coastal fishing village. Could this had been filmed in Kampung Punggol? A 1950s-60s topographical map of Punggol Point and vicinity. 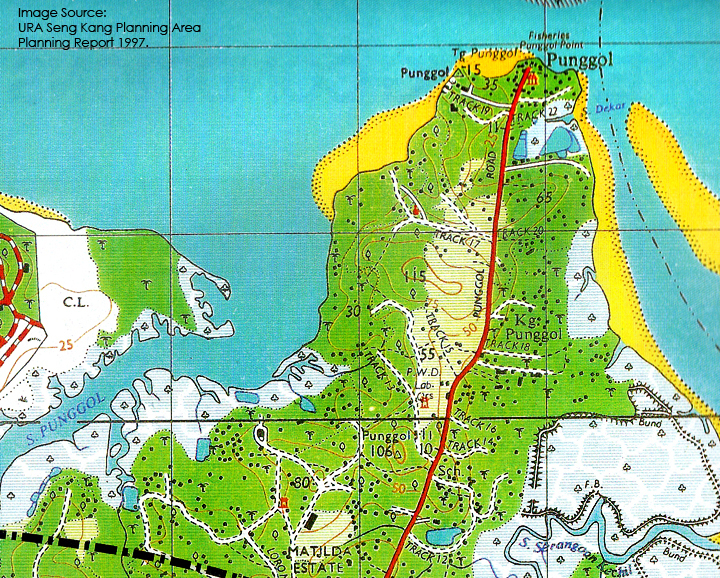 The film “Chinta” was presumably shot on the intertidal flats (areas marked yellow on the map), rocky and mangrove shores of Tanjung Punggol or Punggol Point. 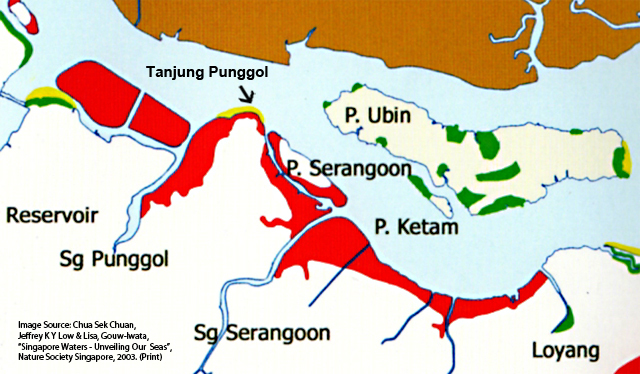 Some of the sequences could have been shot along the mangrove coasts (areas marked white with tree symbols) along Sungei Dekar (now the Coney Channel). Kampung Punggol (marked “Kg. Punggol on the map) could be among the film locations in “Chinta” as well. 2002 map of Northeast Singapore. It shows the extent of land reclamation on the northeastern coast of Singapore undertaken by HDB between 1985 and 1992 (denoted by the areas coloured red). 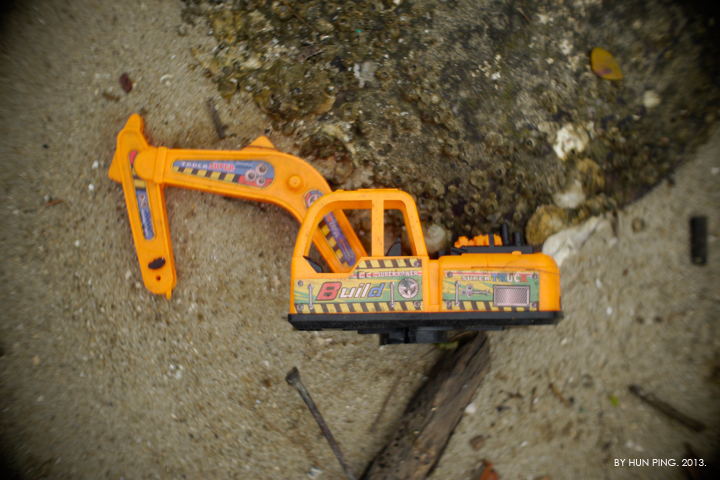 Tanjung Punggol (Punggol Point)’s foreshore was also reclaimed in small parts. So, the natural coastlines of rocky shore and intertidal flats that we witnessed in “Chinta” no longer exists today. Neither have the mangrove trees in the film survived. 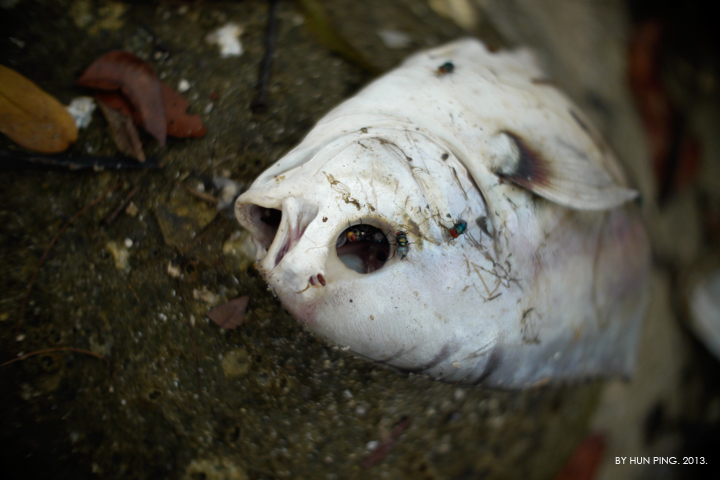 I wouldn’t expect it to be as pristine as the coasts where and when the film was shot, but as opposed to a coastal village in the mood for love, one is more likely to find Punggol Point Beach today ridden with rubbish, dead fishes and trash that floated from across the Johor Straits. Though reclaimed (thus un-natural) and rubbish-ridden, today’s coastline surrounding Tanjung Punggol (Punggol Point) and Punggol Beach is still very much a mix of rocky shore and sand/mud flats supporting a flourishing intertidal ecosystem. One has to visit the beach during low spring tides (ie. 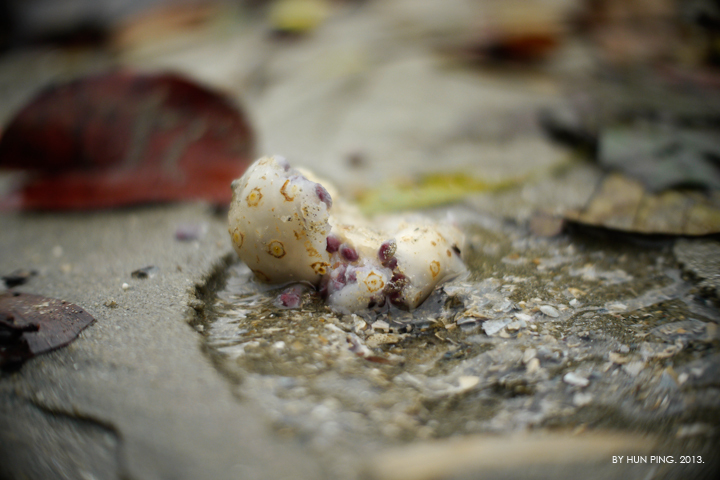 midnights) to marvel at the intertidal fauna frolicking on the mud flats and under the rocks. 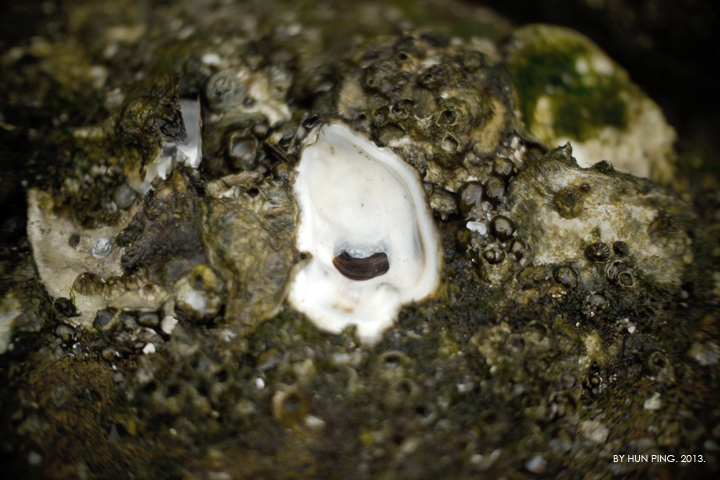 Picking oysters on the rocky beach. Reclaimed islands — Pulau Punggol Timur and Pulau Punggol Barat — in the background. 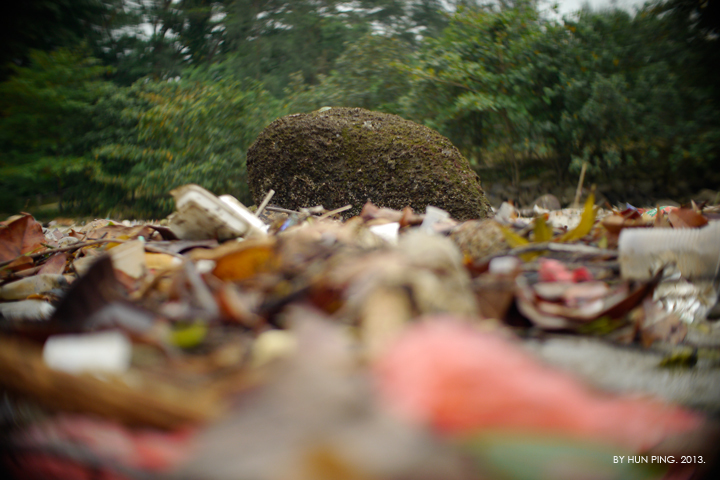 Coastal rocks, and trash from the straits. Partially submerged coastal rocks. Pasir Gudang in the background. I can’t resist the temptation to attach two more compelling sequences of songs composed by the great Zubir Said, both with Sanchi (S Roomai Noor) arriving from sea and being received by an anticipating crowd. Filmed presumably around Tanjung Punggol. This entry was posted in 1940s, Malay Film Productions (Shaw Brothers), Malay-language Films, Singapore Geography, Singapore-produced and tagged 1948, anemones, b s rajhans, bakau, barnacles, bruguiera gymnorhiza, chinta, daeng harris, fishers' island, gelora asmara, indrapuri, intertidal, johor straits, kampung punggol, land reclamation, love, malay classic film, malay film productions, mangrove, nelayan, nona asiah, oysters, p ramlee, pasir gudang, pulau nelayan, pulau punggol barat, pulau punggol timur, punggol, punggol point, punggol point jetty, punggol road end, rhizophora, rocky shores, roomai noor, selamat berjumpa lagi, singapore, singapore coastline, singapore film, siput sarawak, stilt roots, tanjung punggol, zubir said. ← She took the “Malayan Railway” train at Bukit Timah to evade the adulterer. Thanks for pointing this out. Will correct the error.